This is the best Fitbit you can buy, period. It's an incredible fitness and sleep tracker, comes with a built-in GPS, allows you to pay for things from your wrist, and it's water resistant. If you don't care about smartwatch features and are looking for a high-end Fitbit device, buy the Ionic. The software still needs some work. Fitbit OS is laggy and notifications are limited right now. Comparing the Ionic's smart features to other smartwatches on the market, there's no contest—there are better devices out there. Before you go out and spend $300 on this device, just know that the Fitbit Ionic is a great fitness watch and a so-so smartwatch. Fitbit is probably the most well-known company in the fitness tracker world, but smartwatches are new territory. The closest they’ve come to making a smartwatch was 2015’s Fitbit Blaze, but even that wasn’t all that smart. Things are about to change though, as Fitbit is now going all-in on smartwatches. But is Fitbit’s first take at a smartwatch worth your hard-earned cash, or are you better off going with a device from Google, Apple, or Samsung? Find out all the details you need to know in our Fitbit Ionic review. Review notes: I’ve been using the Fitbit Ionic as my main fitness tracker for roughly two weeks. The Google Pixel 2 XL has been my smartphone companion of choice for the duration of this review. Fitbit has made huge strides on the design front in recent years. The company’s Charge 2 and Alta HR look more like fancy bracelets than fitness trackers. That design philosophy hasn’t translated over to the Ionic. Its aluminum frame is angular and boxy, which makes it look much less elegant than the Apple Watch or LG Watch Style. Although, “Elegant” doesn’t seem to be the route Fitbit wants to take here. The company says the Ionic’s design is all about space exploration and space in pop culture. That’s a nice concept. I don’t think it makes for a smartwatch that people will want to wear every day. It looks a lot like the Fitbit Blaze, which I wasn’t a huge fan of either. Ionic’s look doesn’t reflect how it feels, though. After a few moments with the Ionic on my wrist, I could tell Fitbit put a lot of work into making the device feel every bit as high end as you’d want it to. The case and buckle are made of aluminum. The strap offers a nice balance between plasticky and rubbery. It’s never gotten caught on any of my shirt sleeves, though the stock strap might not be the best fit for everybody. I’ve found the sport strap to be more comfortable due to the more classic watch strap-style clasp. The size might not be for everyone. Speaking of straps, the Ionic’s are interchangeable, making it easy to swap out a sport strap for a leather or classic one if you want it to look a little classier. Unfortunately the straps are proprietary, so you can’t use any other strap you have lying around. On its front, the Ionic sports a slightly curved 1.42-inch LCD touchscreen display, with a layer of Gorilla Glass 3 on top. It’s very easy to see the display outdoors in direct sunlight, and there’s also an ambient light sensor so the brightness will auto adjust for different conditions. You can set the display to only activate when it senses you’re looking at it. A simple raise of the wrist will activate the display in this case. Around back, the Ionic features an optical heart rate sensor, though it has much less of a bump than other Fitbit devices. 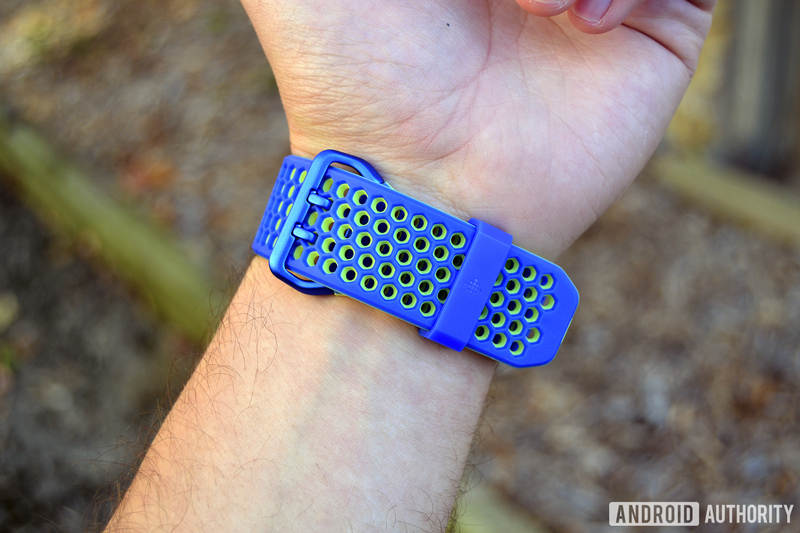 This means you won’t get any weird marks on your wrist if you wear it too tight. There’s one last thing to mention on the design front—the Fitbit Ionic is water resistant! It took Fitbit a very long time to make a water resistant fitness tracker (Garmin, Misfit, and others have been doing it for years), so it’s very nice to see the Ionic sport has a 5 ATM water resistance rating. Contactless payments seem to be all the rage nowadays, and Fitbit is throwing its hat into the ring with Fitbit Pay. You can use Fitbit Pay at any store that accepts contactless payments, and there are already a handful of major banks that work with the service. As we’ve learned with Android Pay and Apple Pay, it might be a little while until your local bank adds support for Fitbit Pay. If you have a bank that works with Fitbit Pay, you're in for a seamless experience. If you have a bank that works with Fitbit Pay, you’re in for a seamless experience. Just long-press the Ionic’s left side button, touch the watch to the payment terminal, and that’s it. Don’t worry, all purchases are protected by your bank’s fraud protection, and Fitbit says it uses industry-standard tokenization to keep each and every transaction private. Paying with your wrist is super convenient since you aren’t required to pull out a physical card. From a fitness tracker’s perspective, it’s even more convenient. When you’re out on a run around town and need to stop for a quick drink, having a watch capable of making contactless payments means you don’t need to carry around a credit card or cash. One of my biggest gripes with the Blaze was that it could only relay call, text, and calendar notifications, and I’m happy to say that’s not the case here. The Ionic will be able to relay calls, texts, calendar events, emails, and pretty much any other app notification you receive on your smartphone. The problem is, the notifications you receive aren’t actionable. That means you can’t reply to messages, dismiss phone calls, or even send quick canned responses from your wrist like many other smartwatches can. You can swipe away notifications you receive, but that only clears them from the watch, not your phone. Notifications still aren't actionable on the Ionic. It’s also a little odd that you have to swipe up from the bottom of the Ionic to access your notifications, which is the opposite of pretty much every other operating system I’ve ever used. Out of the box, the Ionic comes with roughly 2.5 GB of storage space for music files. You can either use that space to load up your favorite playlists, or download some of the top stations from Pandora. Once loaded onto the watch (the process takes some time), you’ll be able to listen to those playlists with your favorite pair of Bluetooth earbuds without needing your phone nearby. The Ionic will become more powerful in the future as more developers build apps for Fitbit’s newly launched smartwatch platform. As you may recall, Fitbit bought popular smartwatch maker Pebble last December to help beef up its smartwatch efforts. The Fitbit App Gallery (Fitbit’s new app store) is a product of that acquisition. Right now there are only a handful of third-party apps available in the Fitbit App Gallery, including AccuWeather, Pandora, Starbucks, and Strava. That number will grow quite a bit over time, but for now, app selection is pretty limited. Hopefully the Fitbit OS lag issues can be resolved with a software update. With the introduction of the Ionic, Fitbit built its very first smartwatch operating system called Fitbit OS. Navigating around the UI is intuitive (aside from the notifications), though it has its quirks. Swiping around the interface results in quite a bit of lag, no matter where you are in Fitbit OS. I’ve found it to be especially laggy when typing in my PIN before making payments with Fitbit Pay. I’m hoping these issues can be resolved with a future software update. The Ionic comes with 17 pre-installed watch faces, and there’s a good mix of digital and analog faces to choose from. One small quirk I’ve noticed—changing your watch face is slow as molasses. It takes almost a full minute for the watch to sync up after you select a different watch face. The Ionic is a fitness tracker at its core, and it’s a damn good one. Throughout the day it’ll track your steps taken, distance traveled, calories burned, active minutes, floors climbed, sleep, and heart rate. As for the basics, the Ionic is just as accurate as other fitness trackers out there when it comes to tracking your steps, calories, and active minutes. The Ionic is a fitness tracker at its core, and it's a damn good one. The device will tracks a handful of different sport profiles like running, treadmill running, cycling, hiking, weights, and swimming. There’s also an interval timer and “workout” mode built into the device. When you’re out on a run, the watch will display your distance, pace, total time, steps taken, calories burned, and heart rate. All of these metrics will also be tracked when you’re cycling, with the addition of current speed and average speed. When you’re swimming, it’ll track your total yards and number of lengths. For weight tracking and workouts, you’ll only get heart rate information, time, and calories burned. There’s no rep counting in weight mode yet, but as Garmin is learning the hard way, it’s not always easy to accurately track reps.
Once you wrap up your exercise, you’ll be shown additional details like bpm average/max and elevation gain/loss. Even more granular details can then be found in the Fitbit app after the syncing process wraps up. If you find yourself going on an impromptu run, the Ionic has a handy auto run feature which will automatically begin tracking a run after a few minutes. This will also trigger the GPS. Auto run shouldn’t be confused with SmartTrack, Fitbit’s automatic activity recognition feature. When SmartTrack is triggered (usually around 15 minutes into an exercise), the Ionic will track how long you were active, how many calories you burned, and your heart rate zones. The GPS won’t activate for this. The Ionic is great at tracking distance and pace thanks to its built-in GPS with GLONASS. This is the first Fitbit with a GPS since the Surge, so folks looking for a more powerful Fitbit device finally have another option. GPS accuracy is in line with other devices like the fenix 5 and vívosport. In most cases it takes only a few seconds to lock into GPS mode at the beginning of a workout. Fitbit’s PurePulse heart rate sensor is here too, and it will automatically track your resting and active heart rate throughout the day. The Fitbit app does a great job at showing your resting heart rate over a period of one week, one month, three months, and one year. In terms of accuracy, I’ve found the Ionic’s heart rate sensor to be somewhat accurate compared to the Polar H10 chest strap, though not as accurate as I’d like. For this particular workout, I took a three-mile run on the treadmill. Both the Polar H10 and Ionic reported my max heart rate to be 199 bpm, while the fenix 5 only reported a 157 bpm max heart rate. Overall though, the fenix 5 was the closest to the H10’s data, as both devices show a slow climb in heart rate over the 30-minute workout. The Fitbit Ionic struggled to keep up with my rising heart rate around the middle of the run, though it eventually managed to catch up with the H10. No matter which fitness tracker you’re using, you should know that wrist-based heart rate sensors aren’t going to be as accurate as chest straps. The technology is still limited because there are so many variables (skin type, hair) involved that can throw off the sensor. Unfortunately the Ionic is unable to pair with other heart rate sensors, so those looking for more accurate heart rate tracking are out of luck. Using your heart rate data, the Ionic will also give you a measurement of your Cardio Fitness Level, which will help you get a better understanding of your overall fitness compared to other people your age and gender. Tucked away in the heart rate section of the Fitbit app is your Cardio Fitness Score, which is an estimate of your VO2 Max. VO2 Max is the maximum volume of oxygen your body can take in during exercise at your maximum performance. Not only can you see your Cardio Fitness Level compared to other people, the app will give you pointers on how to improve your score. Losing weight and exercising more frequently can help give you a better score, for instance. The Ionic also has a feature called Fitbit Coach, which is basically the same thing as FitStar on the Blaze. Just open up the Coach app on the watch and you can choose three different workouts: 10-Minute Abs, 7-Minute Workout, or Treasure Chest. Each one of these options will walk you through a different exercise right on the watch itself, which is incredibly handy if you want to exercise but need a bit of guidance. I wish Fitbit Coach offered more pre-installed workouts, but Fitbit says more will be added in the future. Fitbit Coach is basically the same thing as FitStar on the Blaze. Earlier this year, with the introduction of the Alta HR, Fitbit also unveiled two new sleeping features which are featured on the Ionic: Sleep Stages and Sleep Insights. Sleep Stages uses the heart rate sensor to estimate the amount of time you spend in light, deep and REM sleep, as well as the time you spend awake each night. Sleep Insights uses all the data your Ionic collects to provide personalized guidance on how to better improve your sleep. Both of these features work flawlessly on the Ionic. The Sleep Stages graph is very easy to read and understand, and you can isolate each stage (awake, REM, light, and deep) for an even more granular look at your sleeping patterns. Sleep tracking works flawlessly on the Ionic, and it's only going to get better over time. Fitbit also included a new hardware component on the Ionic: a relative SpO2 sensor. The sensor, using a combination of LEDs and a small camera, will attempt to detect changes in a user’s blood oxygen levels. Eventually Fitbit wants to use it to detect sleep apnea, though it’s not implemented on the device yet. The sensor isn’t available in the Fitbit SDK yet, either. If you find yourself in stressful or frustrating situations from time to time, the Ionic will try to help calm you down. The watch features a Relax that will walk you through two-minute breathing sessions. This feature is certainly useful for those who need help calming down, but I wish the Ionic was able to track your stress. Many devices in Garmin’s lineup feature all-day stress tracking based on heart rate variability, allowing you to see when you’re the most/least stressed throughout the day. I’m hoping Fitbit adds a feature like this soon. In terms of battery life, Fitbit says the Ionic will last over four days on a single charge in smartwatch mode, or 10 hours in GPS mode. I’ve found this to be pretty accurate. I think most people will be able to achieve around four days with regular use, though your mileage may vary if you’re using the device’s GPS more frequently. The charging cable included with the Ionic is pretty bad. It’s magnetic and easy to attach, but the magnet isn’t very strong and falls off if you adjust the watch at all while it’s charging. I’ve been a big fan of the Fitbit app for a long time. It’s easy to use, intuitive, and much friendlier-looking than Garmin’s Connect app. The main screen (Dashboard) gives you quick access to your activity for the day, last night’s sleep, how many days of the week you’ve exercised, your current heart rate, weight, and water and food consumption. The next page over is where you’ll find all your challenges. The page after that lets you brows through Fitbit Coach exercises. You can’t download any of these workouts to your Ionic, however—clicking on each exercise prompts you to download the separate Fitbit Coach app. The fact that Fitbit devices are so popular means you’ll have a better chance of finding someone to compete with. The Fitbit app makes it easy to connect with other Fitbit users and compare activity stats with one another. The app will also give you badges and trophies based on your performance for the day and over time. It’s a great feeling when you receive one of these notifications on your wrist. Fitbit devices are also compatible with dozens of third-party services, such as MapMyRun, Lose It!, MyFitnessPal, Endomondo, and many more. This means if you’re already invested in a certain workout app and still want to use the data from your Ionic, you can. Yes— but only if you’re okay with having a so-so smartwatch. The Fitbit Ionic is available from Fitbit.com and Amazon for $299.95. I think that’s a fair price for what you’re getting. Yes, it’s pricey but the Ionic is miles better than any other device Fitbit has made, and that comes at a cost. This is the best Fitbit you can buy, period. It’s an incredible fitness and sleep tracker, comes with a built-in GPS, allows you to pay for things from your wrist, and it’s water resistant. If you don’t care about smartwatch features and are looking for a high-end Fitbit device, buy the Ionic. The software still needs some work. Fitbit OS is pretty laggy and notifications are limited right now. Comparing the Ionic’s smart features to other smartwatches on the market, there’s no contest—there are better devices out there. However, these other devices (Apple Watch, Android Wear watches) are smartwatches first, fitness devices second. You’ll want to keep that in mind before casting the Ionic aside. I have no doubt that Fitbit’s Ionic 2 or Ionic 3 will address many of the pain points listed here. But for now, just know that you’re getting a fantastic fitness watch and a so-so smartwatch. There you have it, our Fitbit Ionic review. What are your thoughts on the Ionic? Have you used one? Let us know your thoughts in the comments!